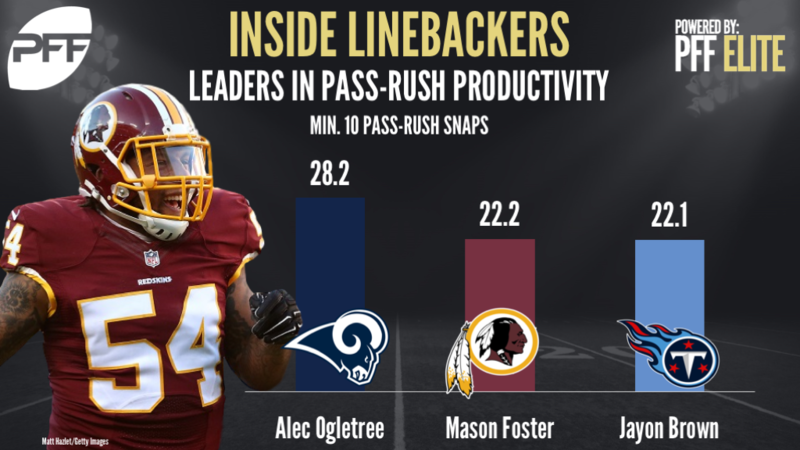 With just Monday Night Football left to play in the NFL’s Week 7, it’s time to check in on some more PFF Elite stats, and this week we’re going to be highlighting the league’s inside linebackers and their best performers in every facet of the game for an inside linebacker. PFF’s “Run Stop Percentage” gives us a clear measure of a player’s effectiveness against the run on a per snap basis, that looks far beyond just the number of tackles made. In his first full season at the 3-4 inside linebacker position, the former safety-turned-linebacker is proving to be an integral part of Wade Phillips’ defense in 2017. Through seven games of the season, Barron has played a total of 165 snaps against the run and has produced 27 tackles and 19 stops. 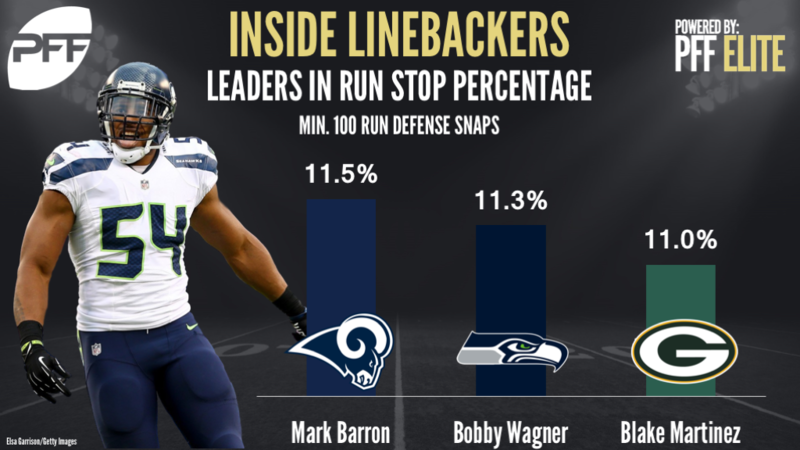 Barron moved to linebacker full-time in 2016, and he has produced 52 total run stops since, the fourth-most among off-ball linebackers in that span. Since he entered the league in 2012, Wagner has developed into one of the best all-around linebackers in the game, and his excellence in all facets is the reason he currently ranks first among linebackers with an ‘elite’ grade of 94.9. This season, against the run alone, he’s played 133 defensive snaps and has tallied 15 stops, bringing his career run-stop total up to 194, the second-most among linebackers since 2012. Martinez was selected with the 131st overall pick of the 2016 NFL draft, and has been a revelation against the run ever since. Since his first game as a pro, he’s played more run defense snaps (392) and produced more run stops (41) than any other linebacker in his draft class. This year alone, Martinez has played 182 run defense snaps and notched 20 total stops, the second-most among inside linebackers. PFF’s “Tackling Efficiency” number shows the number of attempted tackles per missed tackle. The higher the number, the better the performance. Heading into the 2017 NFL draft, one of the biggest concerns about the former Temple edge rusher was his lack of consistency while tackling. In his senior season alone, Reddick missed 15 tackles on 76 attempts and ranked 52nd of 57 draft-eligible 3-4 outside linebackers with a tackle efficiency of 4.8. However, Reddick deserves credit for cleaning up his act in his first year as a pro. Through seven games, Reddick has logged a total of 177 combined snaps against the run and the pass, attempted 17 tackles and is yet to miss as he adjusts to life as an inside linebacker rather than an edge rusher at the next level. 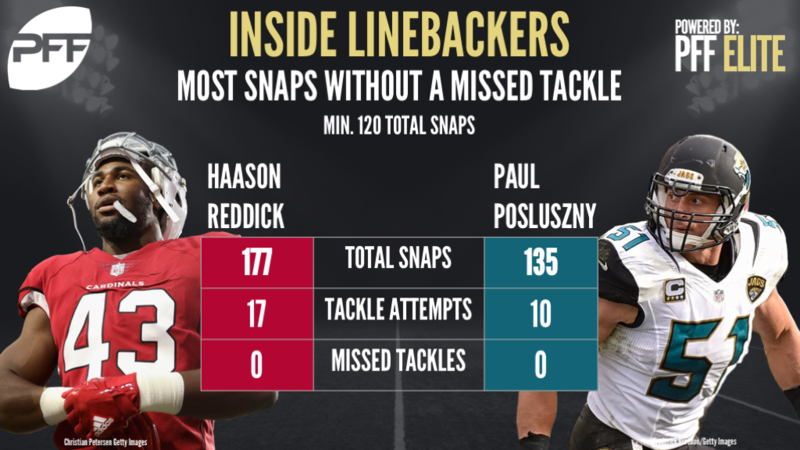 While he is being used in a far more reduced role than he has in years past, (he played 98.1 percent of his team’s snaps in 2016, but has played just 29.8 percent of his team’s snaps so far this year) Posluszny has been one of the most efficient tacklers in the league. Through seven weeks, he’s played 135 snaps against the pass and the run, attempted 10 tackles, and like Reddick, is yet to miss. Posluszny last missed a tackle in Week 14 of the 2016 NFL season. Another feather in the cap of the sixth-year linebacker, Wagner has played 370 snaps against the run and the pass this year, attempted 48 tackles and has missed just one, while defending the run. Wagner hasn’t missed a tackle while in coverage since Week 9 of the 2016 season. PFF’s pass-rush productivity measures pressure tallied on a per-snap basis with a weighting toward sacks produced. It gives us an indication of a player’s production in the pass-rush that goes beyond just sack-total and pressure rate. So far this year, the fifth-year inside linebacker hasn’t graded particularly well, in large-part due to inconsistency while tackling (he’s missed eight tackles – third-most among linebackers). However, Ogletree has been incredibly productive in pass-rushing scenarios. Through seven games, the Rams have sent Ogletree to rush the passer on 39 of his 250 passing snaps, and he’s produced two sacks, three hits and nine hurries – no inside linebacker has produced more pressure, or at a better rate. When Greg Manusky took over as the Redskins defensive coordinator, he promised a more aggressive-style defense, and he’s certainly kept his word thus far. Through five games, he’s using Mason Foster’s athleticism to great effect on blitzes, sending him to rush the passer on 20.0 percent of his passing plays. It’s worked so far, producing one quarterback hit and seven hurries. Foster has the chance to add to his pressure total tonight on Monday Night Football. When the Titans drafted Brown in the fifth-round on the 2017 NFL draft, they added one of the nation’s top coverage linebackers. During his final year at UCLA, Brown recorded three interceptions and three pass breakups, while allowing a passer rating of 50.4 on throws into his coverage – the fourth-lowest rate in the draft class. While the Titans haven’t quite seen that level of production at the pro level, he has been productive rushing the passer. Through seven games, Brown has notched 17 pass-rush snaps and tallied five total pressures (one hit and four hurries), with four of those pressures coming on third down. PFF’s signature “Yards Per Cover Snap” figure takes into account the total number of yards a player has allowed on throws into his primary coverage, factoring in the total number of snaps that player has played in coverage. It gives us a clear indication of a player’s effectiveness and consistency against the pass more so than total numbers of touchdowns or interceptions could. It’s no surprise to see Johnson top this list, as he’s spent the best part of three seasons cementing his place as arguably the best coverage linebacker in the game. Over the last three seasons, Johnson has played a total of 1,298 snaps in coverage and been targeted 116 times. He’s allowed just 67.2 percent of those passes to be caught (best among linebackers with at least 75 targets over that span), he’s tallied 10 pass breakups, three interceptions, allowed a passer rating of 73.2 (second best) and 0.49 yards per coverage snap (also the best mark among linebackers over that time). This season alone, he’s played 244 snaps in coverage, allowed just six receptions from 16 targets, and has allowed a miniscule 0.23 yards per coverage snap. Through seven games, McKinney has already shown improvement from his performance in coverage last year, where he allowed 44 receptions from 53 targets, five touchdowns and an average of 1.18 yards per coverage snap that ranked 45th of 57 linebackers with at least 156 snaps. This year, he’s been much better, and has allowed just 56 yards from 12 targets on his 116 coverage snaps. 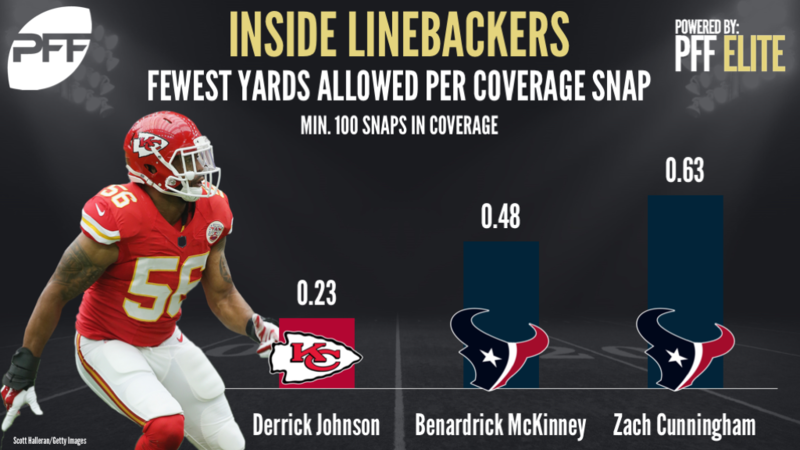 After the suspension of starting linebacker Brian Cushing, rookie inside linebacker Zach Cunningham was thrust into a starting role much quicker than many expected. However, he’s made a good start in coverage through seven games, and has allowed just 87 yards on his 139 coverage snaps.